The thought of Nablus has been haunting me constantly over the past several months. Both the prospect of returning to the Arab world this summer in my current trip to Libya and the realization that my students and friends are more than a year beyond my last memories of them have brought these recollections to the surface. Though only two nations away from where I lay now, Palestine feels like another realm of my existence that is always so far removed but constantly calling. An abandoned home. My junior year of college- the fall in Jordan and spring in Palestine- proved to be a powerful experience. Despite being dictated a bit too extensively by a guy, that year has been the single most life changing experience I have had. I often refer to parts of my life as pre-Palestine and post-Palestine. Though the ‘traveling changed me’ rhetoric is often overplayed and exaggerated, I don’t know how else to explain the transformation. I don’t remember how I was before or how to be how I was. I occasionally catch glimpses of the past in outdated expectations of me some people still hold and in old pieces of my writing, but the recently past me is a looming stranger. Thankfully, before my time in Palestine I lived in Amman, Jordan, which for me, served as the “Levantine for Dummies” version of the Arab world. Though the language, culture, and food are similar to Palestine, the penalty for inefficiently conforming is less painful. Problems from insufficient Arabic vocabulary were eased by the proficient English skills of most Jordanians and too scandalous of clothes resulted in stares but never real danger. I had the culture and language training needed to make the transition to Nablus, with regards to culture and language, easy. Shattered and angry hearted I lost myself in Nablus. I lost what I had come to know as myself and left a different person, but also, I allowed my self to become lost within my experiences and time in Nablus. Palestine occupies a conflicted part of my heart. The pain that I experienced while I was there is unmatched by any emotional or physical experience I have had. (My week in the hospital on morphine with a ruptured spleen after being beaten by a NY “mountain” takes second) Yet, through being so recklessly damaged, I entered into the community of Nablus with an exposed wound, humbled by my vulnerability; I sought refuge and healing in my students, friends, and roommates. The result was a transformed self that, I believe, could not have occurred without an un-ignorable awareness of my own imperfections. I was humbled by my own privilege and made aware of my own relative weakness. Spending time with victims of unjust prison sentences, domestic violence, and deep losses, I was ashamed by my own low tolerance for emotional pain. I began to develop a more balanced perspective on my life. Some things, like the powerful conversations I have and my family became elevated in importance. Others, like making money, focusing on what people think of me, and the hardest of all, holding on to painful romantic relationships, have finally found their proper place in the back of my mind. In the past year in a half I have begun photography and drawing. My relationship with a camera is one which I have pondered relentlessly. On one hand I love that photography forces me to find the spectacular in the mundane. I must stop and take in all aspects of a scene- shapes, lighting, colors, etc.- in order to get the effect I desire in my photograph. I also think that it allows me learn about myself. As I compose a photograph, the choice of subject, the zoom, and various other factors are conditional to my preference and I believe a photo tells us more about the person behind the camera than the subject in front of the lens. My concern is that a camera places a literal barrier between the self and the other, forcing me to remove myself from the scene I am documenting. In addition, photography is inherently exotifying as a photographer selects the extraordinary elements of a scene for documentation. This particularly comes into play with tourist photography, where I tend to (and I believe most do) take pictures of the things most different or unusual from my own normal life. The result is a documented reminder of all the relatively “extreme” parts of a place, and not the ordinary. I have also continued to learn to play the guitar and become a more aggressive and unapologetic activist. I’ve adopted a dog and been accepted into law school. 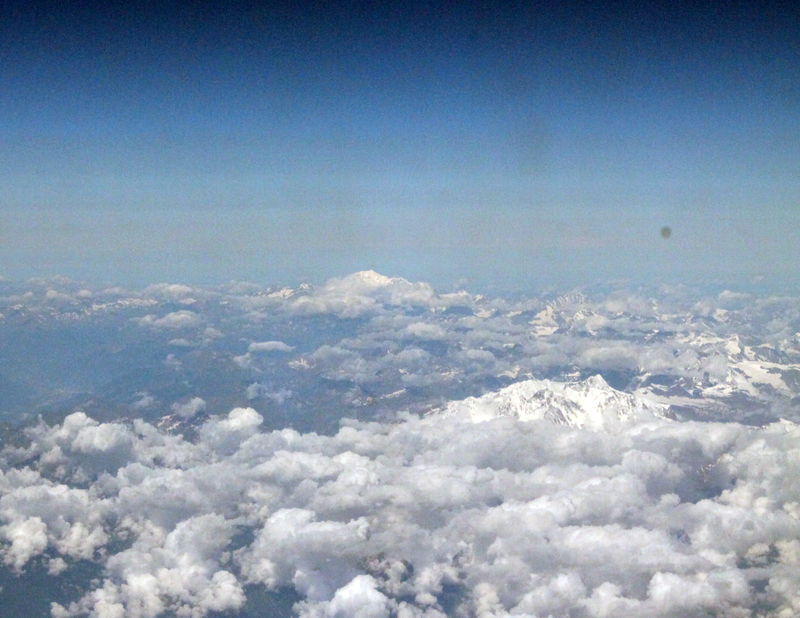 The Alps out of the plane window in the clouds. This entry was posted in A Penny for My Thoughts..., Photography. Bookmark the permalink.